Since the launch of my book and blog, I’ve made it very clear as to why I believe drafting a quarterback early is a bad idea. If you haven’t read any of my previous entries, take a look here, here and here. But what I haven’t touched on is the fact that drafting a middle-round quarterback is an even worse strategy. You see, the approach in taking a first-, second- or third-round quarterback is a bad one because of opportunity cost. In the early rounds of a draft, you lose more projected fantasy points at running back and wide receiver when you decide to not draft one. At quarterback, because there are fewer started in a typical fantasy league, your points foregone decreases each round at a slower rate. Again, take a look at my Value Based Drafting article for more on this. And while I can sit and tell you why Aaron Rodgers isn’t worth a first overall pick, you may not believe me because he is, after all, much better than the majority at his position. I can’t argue that, but that’s not what I disagree with. It’s the same logic used to draft Calvin Johnson early on in your draft. Let’s just assume that we’ve moved passed this whole argument. You didn’t draft Aaron Rodgers in the first round because someone else did before you, and for whatever reason, Drew Brees and Tom Brady went really early too. Fine. You got someone like Maurice Jones-Drew instead, and then in the second round you snagged Matt Forte. Coming up in round three and four, you went back to back with wide receivers, drafting Roddy White and Demaryius Thomas. You have two wideouts and two running backs. The next logical step is to get a quarterback, right? Wrong. Getting one at this point could actually be the worst decision you make on draft day. Red represents players that had a lower rank at the end of the season compared to pre-season. Green represents a higher end of season rank compared to the pre-season. As you can see, there have been just two instances over the last five seasons where a middle-round quarterback actually finished better than projected. And moreover, just four of the fourteen (28.5%) in the sample data have finished a season as a top-10 quarterback. None of the quarterbacks finished above fifth. When there are 12 teams in your league, and you have a quarterback that’s ranked 8th or 9th, then you more than likely have a quarterback in the bottom 25% of your league. It’s why we can’t look at these rankings and say, “but he was still ranked 12th!” Being ranked 12th is the same as being ranked 24th at running back. And being ranked 24th at running back is like working at an entry-level position: It may be alright and you still mean something to the company, but there are a lot of people ahead of you that are more important. Your 5th and 6th round selections aren’t meant to be entry-level employees that stay in that position throughout their careers. They’re meant to be entry-level employees who become managers in just a year with the company. How are you ever going to succeed if you’ve just hired a bunch of entry-level guys with little to no ambition to become something more? 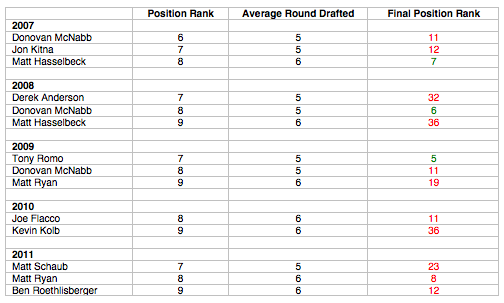 The fact is, drafting a quarterback in the middle rounds isn’t all that much different compared to drafting one in round 8 or 9. History actually tells us that these rounds yield more top talent. Red represents players that had a lower rank at the end of the season compared to pre-season. Green represents a rank 8th or better. Rather than looking at whether or not these players finished higher than their projected rank, I took a look at the players who finished 8th or higher. Why? Because that’s where round 5 and 6 quarterbacks are projected to finish, and since the players drafted in rounds 8 and 9 are already ranked low, who cares if they finish as the 10th best quarterback? Looking at the data, there were 5 instances of quarterbacks finishing as a top-8 quarterback. That’s 29% of them. Compare that to quarterbacks drafted in rounds 5 and 6, and you get 28.5%. 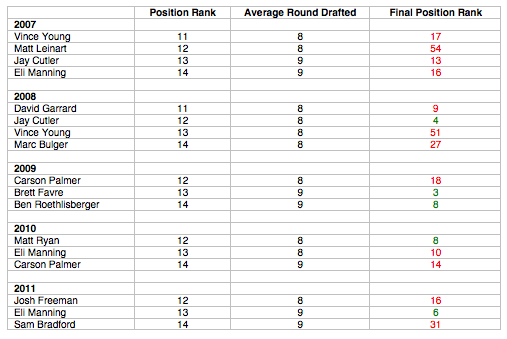 And furthermore, two players drafted in rounds 8 and 9 finished as a top-5 quarterback. There were zero instances of this with middle-round quarterbacks. You’re arguably getting better talent in the later rounds of a draft compared to the middle ones. And while you may conclude that late-round quarterbacks finish way outside the top-12 more often…who cares? Why does it matter if your quarterback finishes as the 15th ranked quarterback or the 30th ranked quarterback? It’s not as though you should be starting either one of them. And if you are, you’re not thinking “championship”. I’ve said that late-round quarterbacks are more valuable than early-round ones because of opportunity cost. Now what’s the conclusion as to why I value late-round quarterbacks to middle-round ones? It’s pretty simple, actually: Middle-round quarterbacks just aren’t that much better. A fantasy football draft is psychology driven. When fantasy owners see positions coming off the draft board, they automatically think that they need to draft that position in order to not “fall behind”. It’s what we call falling victim to a draft run. When you make a draft choice based on a draft run, all you’re doing is inflating the value of that player. You’re getting him a round or two earlier than he should be drafted for absolutely no reason. You may feel it’s important to get a quarterback in the 5th or 6th round of a draft because many have been drafted in the first four, but you should actually use the opposite logic. It’s why ranking players in tiers is so important when you draft. If there’s a clear drop off at a position, why would you reach for him because his peers have been drafted? You need to draft for value, not for need. And to me, this is precisely why we draft quarterbacks in the middle-rounds. There’s been a clear drop off between the top tier quarterbacks to the second over the last five seasons – the seasons I’ve examined above. Think about it – Drew Brees, Aaron Rodgers, Tom Brady and Peyton Manning have all been consistently at the top. You know the chances are very high that they’ll finish at the top of their position. 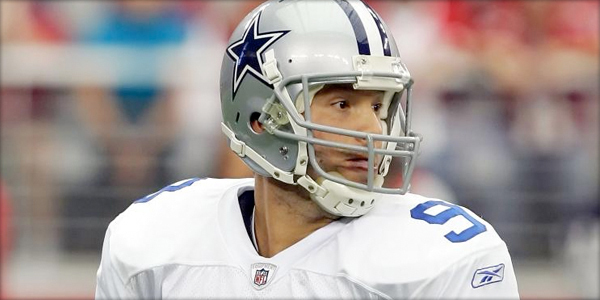 Sure, there will be years where players like Tony Romo or Michael Vick will finish as elite quarterbacks. But there’s no reason to try in predicting that. When a player – like Romo – consistently finishes as a 6th or 7th ranked quarterback, then why are you reaching in the fifth round for a middle-of-the-road starter? Get depth instead of getting a quarterback in round 5 and completely ignoring the position for the rest of the draft. Not only will the depth be valuable when a player in your lineup gets hurt, but it can help you when trading throughout the season. I understand that this sample data is small. But we have to remember – the NFL is different than it was in 2002. And even if you want to look at that data, it still gives similar results. Fantasy owners are drafting quarterbacks even earlier this year than where they’ve historically gone. And it’s because fantasy experts are telling you that you need one. Heck, the 10th ranked quarterback in most drafts, Phillip Rivers, is being drafted in the 6th round. And five quarterbacks are going in just the first two. It just doesn’t make any sense, and it’s another reason to wait on a quarterback in 2012. If you’ve believed me and my mathematical logic regarding not drafting a quarterback in the first round, then you definitely should follow this method too. At least people can make an argument for Rodgers. You can’t make an argument for drafting a 9th ranked quarterback in the 5th round. It’s why getting Michael Vick, Tony Romo, Peyton Manning, Eli Manning and Phillip Rivers isn’t logical. If you think one of those guys can finish ahead of Brady, Brees, Rodgers, or Stafford, then sure – get them. But I think you’re fooling yourself, and you’re creating more risk than needed on your team. Instead, try drafting someone like Jay Cutler. He’s got a high upside, and if it doesn’t work out, the quarterback position is replaceable because there are typically only one started on each team. Again, just sit back and let the late-round quarterbacks fall to you. While your buddies are drafting quarterbacks in rounds 5 and 6, you know you can get the same caliber guy in rounds 8 and 9. And you’re adding an additional middle-round draft pick for depth.